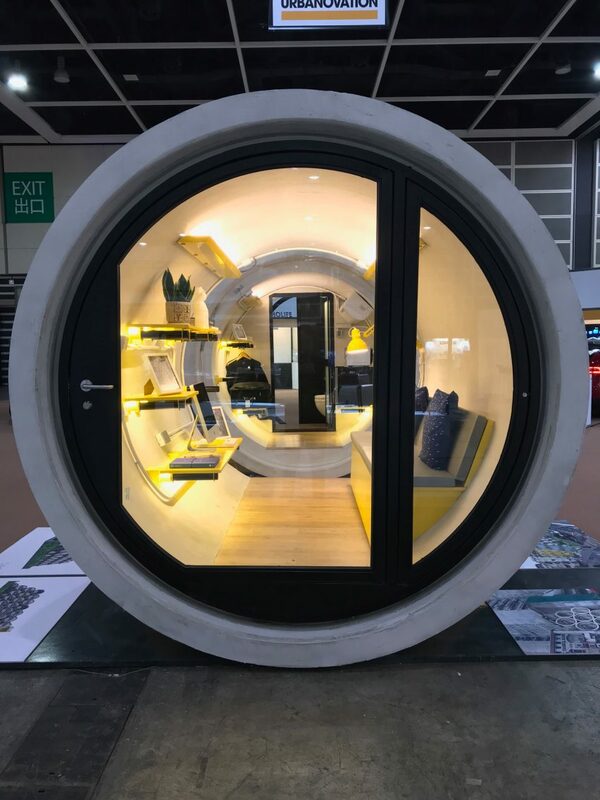 Hong Kong studio James Law Cybertecture has developed a prototype for low-cost, stackable micro homes in concrete pipes, which could slot into gaps between city buildings. 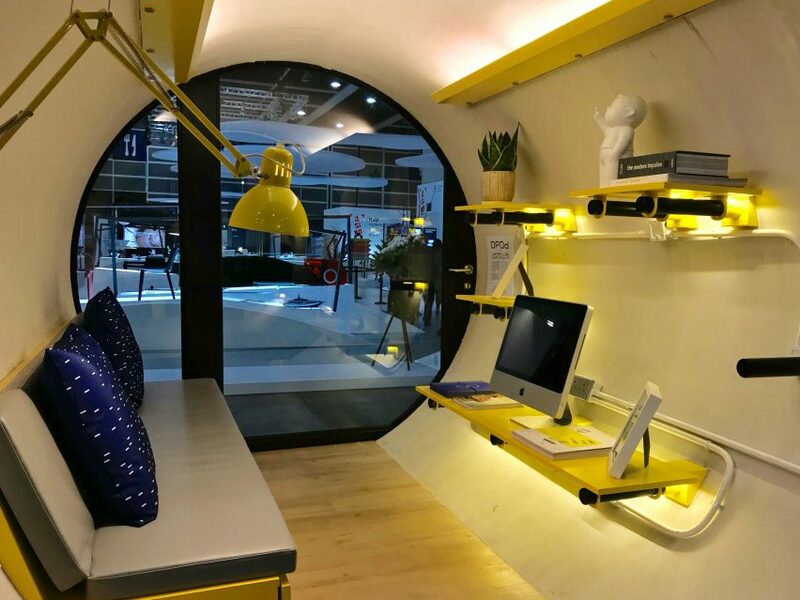 Called OPod Tube Housing, the project sees 2.5-metre-wide concrete water pipes transformed into 9.29-square-metre homes, with doors that can be unlocked using smartphones. 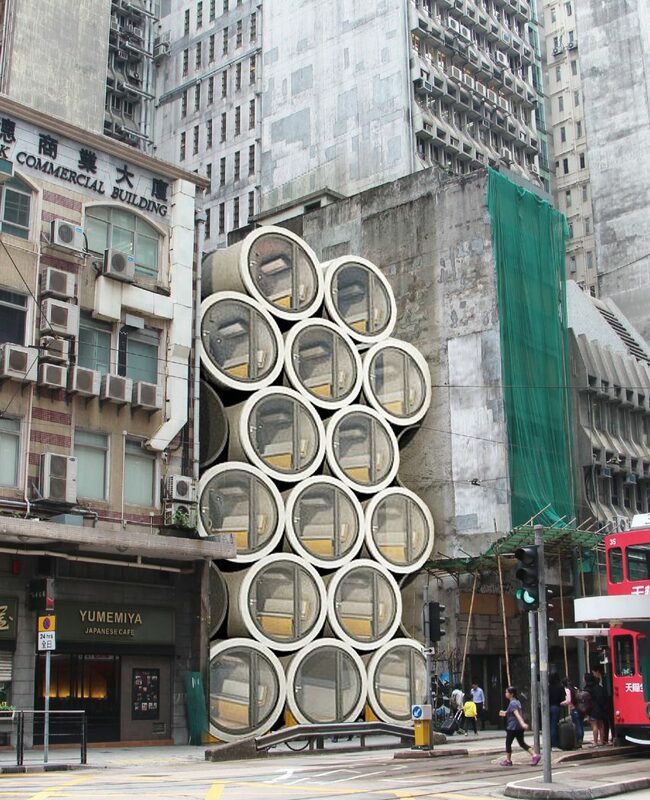 Studio founder James Law envisions these tubular structures being piled up on top of one another, creating affordable starter homes for young people in vacant city-centre locations across Hong Kong. 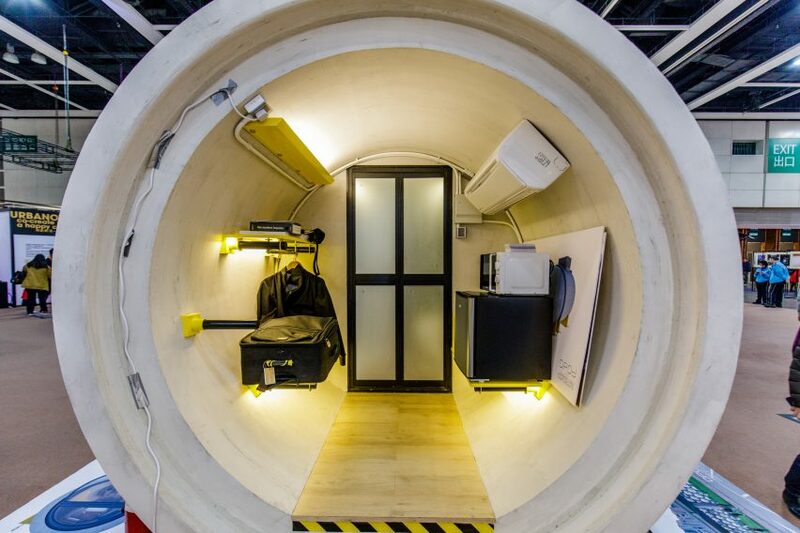 He told Dezeen he thinks residents could live happily in the tubes for one to two years. He believes they would appeal to “young people who can’t afford private housing”. 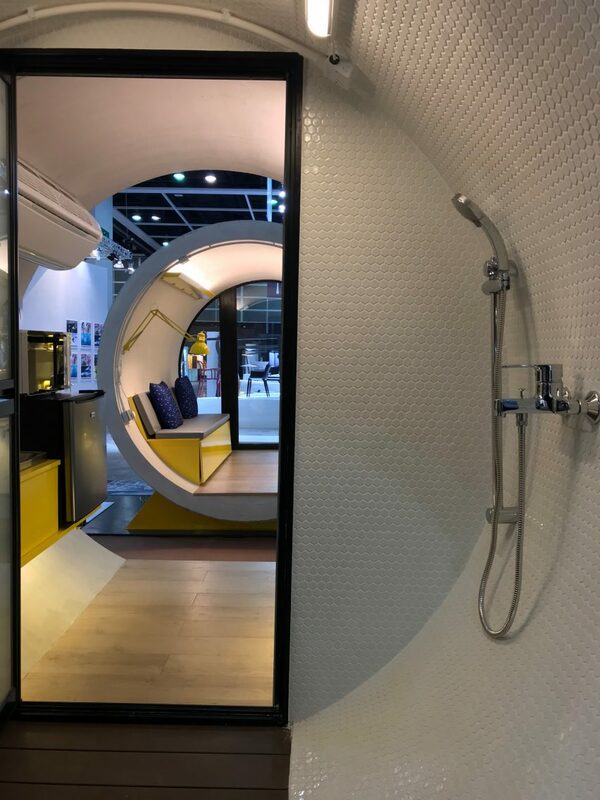 “OPod Tube Housing is an experimental, low-cost, micro-living housing unit to ease Hong Kong’s affordable housing problems,” he said. The OPod project is currently still a concept, but the architect has built a prototype to show how a typical home could look. Inside the curved concrete walls, the home contains facilities for living, cooking and bathing. A fully glazed front panel doubles as a door and window. Additional natural light is provide by lighting strips set under the shelves and a retractable lamp set into the wall. The interior walls are whitewashed, lessening the industrial aesthetic, while a flat wooden floor has been installed to make it easier for the occupant to move around. A bench seat can be folded down to also function as a bed, with the cushions doubling as a mattress. There is also room for a mini fridge, a microwave cooker, a rail to hang clothes from and a stand to place a suitcase on. The rear part of the pipe is been screened off to form a bathroom compartment with a shower and a toilet. The circular walls are tiled with neat white hexagonal tiles, and the floor is covered in slatted boards to provide drainage. Hong Kong is currently facing a major housing crisis, due to a rising population, a high demand for accommodation, skyrocketing property prices, and land limited by the city’s island geography. The 2017 Demographia International Housing Affordability Survey ranked Hong Kong as having the least affordable housing market in the world. Law doesn’t see his proposal as a permanent solution to the crisis, but he believes his design could provide temporary relief for residents looking for something affordable in the short-term. He claims his micro apartments cost approximately £11,000 each to manufacture, and could be rented out for less than £300 a month. The average rent for a one-bedroom apartment in the centre of Hong Kong is currently over £1,500. Because each tube is only 2.5 metres wide, they could easily slot into narrow gaps. And Law suggests they could be stacked up to four high without any additional supports. “With additional structure [they] can be unlimited, within reason,” he told Dezeen. With each unit weighing 20 tonnes, they can be lifted with a standard medium-sized crane onto a long flatbed trailer, allowing them to be relocated with relative ease. They could also be arranged in self-contained low rise modular communities – the architect has developed plans that show the pipes arranged in a horse-shoe formation around access platforms and staircases. In this way, they are potentially more flexible than the hexagonal sleeping pods designed by creative agency Framlab to attach to New York buildings, to house the city’s homeless population. The project is still in the experimental stages. But Law is in negotiation with local government, with a view to start installing and renting out OPod homes. 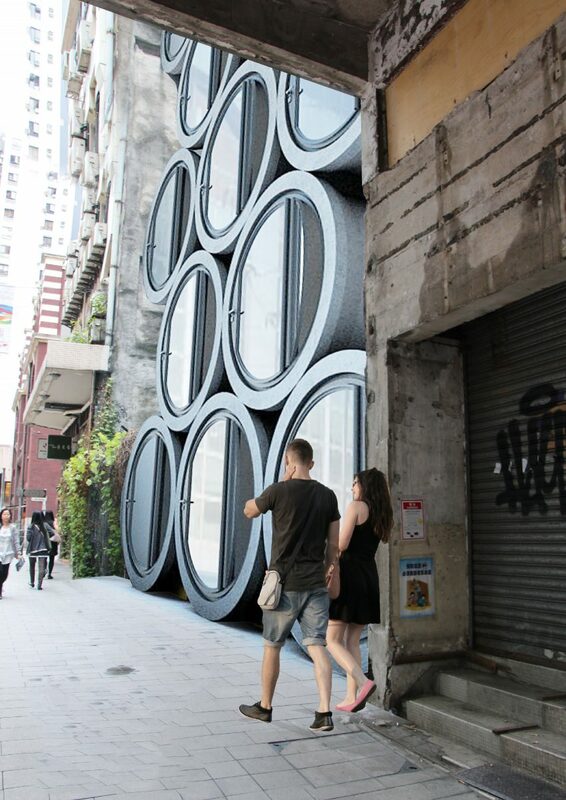 He is not the first architect in the city to come up with this type of proposal – the city’s creative community has come up with various space-saving solutions to combat the ongoing housing crisis. Back in 2014, Hong Kong studio Affect-T suggested that bamboo micro homes could be installed inside abandoned factory buildings. And more recently, local studio Design Eight Five Two used sliding partitions, moveable furniture and concealed storage to make the most of space in a 51-square-metre apartment, while NCDA used a treehouse style mezzanine to make extra space in a 34-square-metre apartment.